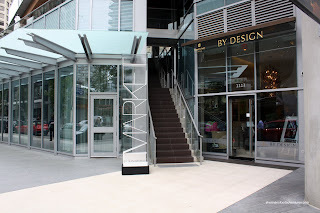 While watching Trevor Bird on Top Chef Canada, it renewed my interest in Market located in the Shangri-La Hotel. Why? Well, Trevor used to be the Chef de Partie at Market prior to opening Fable with fellow contestant Curtis Luk. Okay, it is ironic that I would be interested in Market since Trevor basically lamented the restrictive arrangements of working in a corporate environment. For those who are unaware, Market is only one of many restaurants around the world opened by Executive Chef Jean-Georges Vongerichten. Hence, any chef that works in the kitchen at one of these restaurants are restricted in terms of input and creativity. Now that doesn't mean the isn't any good. 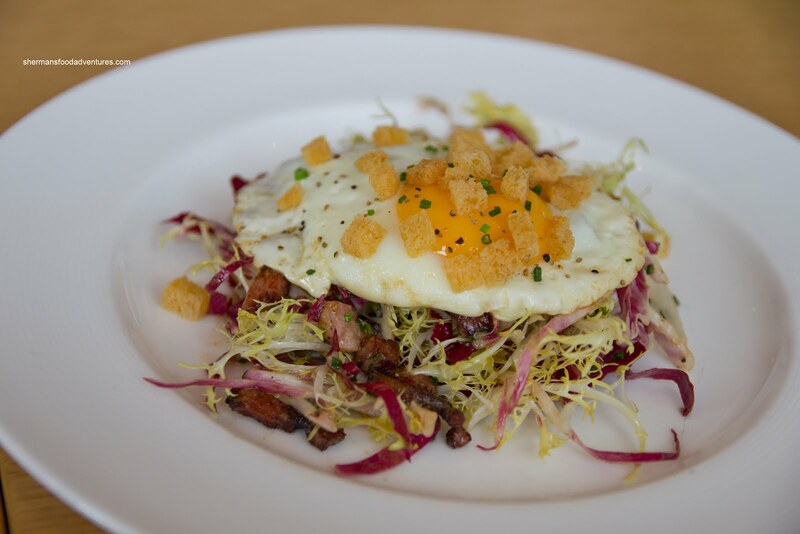 On the contrary, the menus are often designed carefully and executed by well-trained staff. Viv and I had tried their tasting menu awhile back and were happy with the food, especially considering the relatively reasonable prices. The theme of reasonable pricing is further exemplified by their Market Power Lunch which offers a 3-course meal for $29.00. 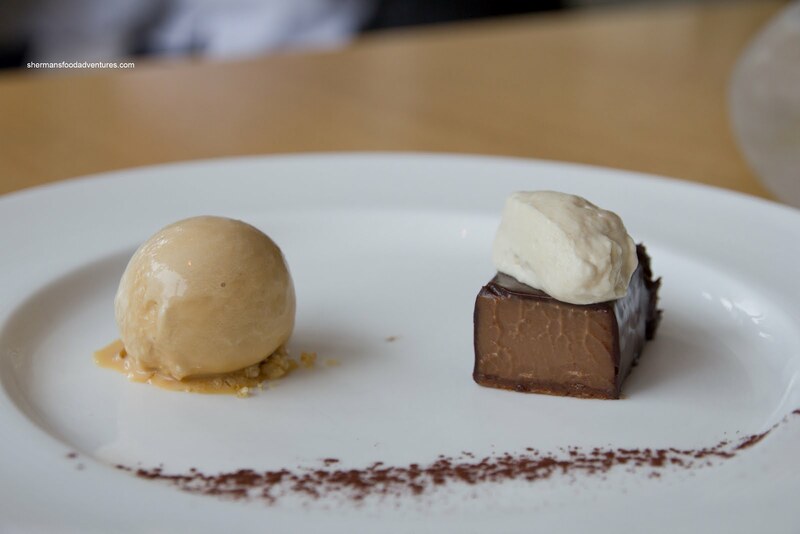 There is a choice of 2 plates from the appetizer and main sections and 1 plate from the dessert portion. Well, I finally got to check it out with Mrs. Spray Bottle, Hot Mama and Pops. 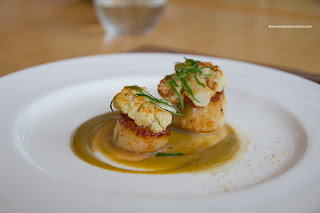 Hot Mama decided to start with the Seared Scallops with caramelized cauliflower and caper-raisin emulsion. As clearly shown in the picture, the scallops were beautifully seared with good caramelization while remaining plump and sweet. The smooth emulsion provided a nice balance to the dish. The "crispy" cauliflower added a bit of textural contrast. For myself, I had the Beef Tartare with crispy onion rings. This was a good version since the meat was super tender and aesthetically pleasing to look at (unlike the one at Onyx). That is very important when dealing with raw meat. In terms of taste, there was a slight kick and crunch from the pickles. Surprisingly, the star of the show were the onion rings. They were super crunchy and not greasy. 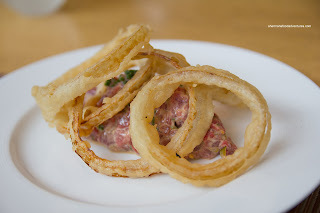 They were great on their own, but combined with the tartare, it added that textural contrast. Mrs. Spray Bottle went for the Frisee and Crispy Lardon Salad with mustard vinaigrette. The basic elements were there for a classic frisee salad, however, it was not as good as the other 2 appetizers. First of all, we personally would've preferred a poached egg since it would have more runny yolk. And secondly, the dressing was not very impactful. The duck fat (?) croutons added a nice crunch though. For their main, Hot Mama and Mrs. Spray Bottle both had the Angel Hair Pasta with asparagus and shiitake mushrooms. 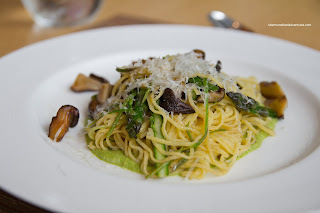 This was a well-executed dish consist ing of al dente angel hair pasta (which is very difficult to do), pesto and Earthy mushrooms. There was an underlying heat that did not disrupt the other flavours. Pops went for the most filling dish being the Market Burger with black truffle dressing, brie and French fries. To everyone's surprise, the burger arrived with 2, count' em 2 large patties. These patties were nicely grilled and were moist. 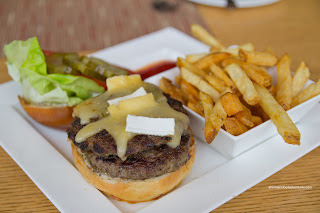 The truffle dressing was not too overbearing while the melted brie made the burger quite buttery. Combined with the crisp veggies within a soft brioche bun, th is was a good burger. As for the side of fresh-cut fries, they were of the double-fried variety which yielded crispy spuds which would've been good dipped in mayo. I guess we should've asked for some eh? 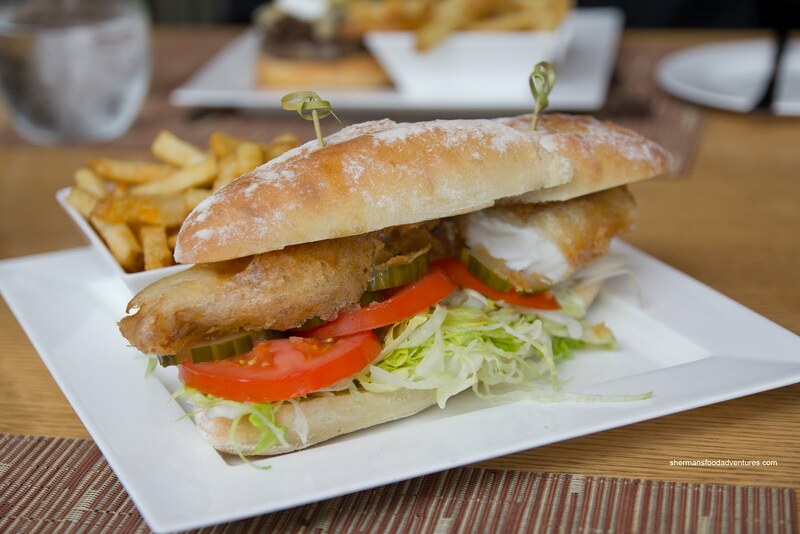 For myself, I had the Crispy Snapper Sandwich with black olive tartare sauce. This was an absolute monster of a sandwich with 2 large pieces of fried snapper within a ciabatta bun. The snapper was super moist and perfectly fried. However, the batter was somewhat oil-soaked and greasy on t he bottom side of the fish. Now that didn't diminish my enjoyment of the sandwich though because the black olive tartar sauce was like a creamy tapenade which added a different flavour to a pretty "normal" sandwich. I found the bun to be rather hard, which essentially destroyed the fish every time I bit into it. Moving onto dessert, I went for the Peanut Butter Bar with salted caramel ice cream. The bar was super smooth which started off chocolaty and had a peanutty fi nish. It wasn't super sweet, which suited me just fine. The salted caramel ice cream was definitely sweet. I liked the crunchy pieces underneath. 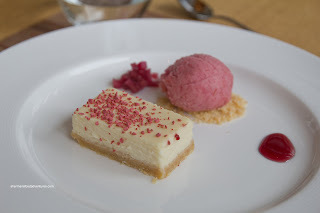 Everyone else had the Market Cheesecake with crispy strawberries and rhubarb sorbet. The cheesecake was smooth and cheesy while the sorbet was sweet with bits of rhubarb. Nothing particularly exciting about this dessert, yet it was solid nonetheless. Bottom line, it was an enjoyable meal. Considering its location, the decor, service and generally well-executed food, $29.00 is a very reasonable price to pay. Please also try their tuna tartar and truffle pizza; as well as the steamed shrimp salad! maybe the dinner and lunch were different! Regardless, the fries were pretty awesome!